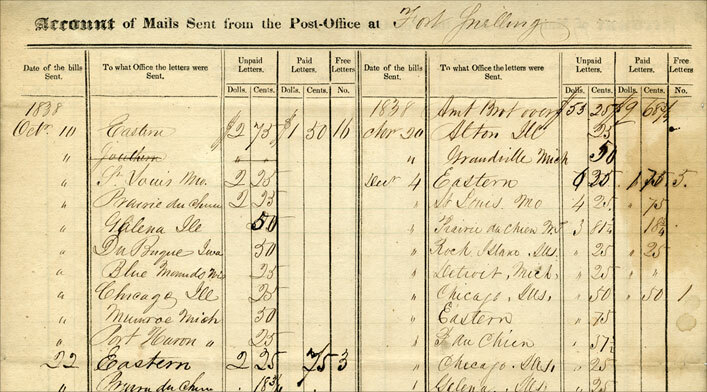 This mail register reveals details about the rates and routes of letters sent from Fort Snelling during the winter of 1838. During this period, postal workers carried mail from office to office and did not deliver it to, or retrieve it from, individual households. The U.S. Post Office based its letter rates on both the number of pages being sent and the distance they were to travel. Thus, letters travelling 0–30 miles cost $0.06 per page, while letters travelling 400 miles or more cost $0.25 per page. This column records the date each letter left the Fort Snelling office. These columns indicate how the mail was paid for. Most letters were paid for by their recipients at the time of delivery, but a few were paid in advance. Letters sent between government officials could be sent free of charge. This line shows that on December 4, 1838, the Fort Snelling post office sent $0.50 of unpaid letters, $0.50 of paid letters, and one free letter to Chicago, Illinois. $0.50 in 1838 currency is the equivalent of about $12.00 in today’s money.